Out of the six eggs, two hatched and we have two live chicks. We were down to five eggs anyway as we had broken one egg when we lifted Betty out of the coop once to encourage her to go for a poo, a bite to eat and a bit of drink. We were concerned she would lose condition sitting for 21 days without leaving the nest! I found one dead chick, squashed by the hen before it was ready to hatch. Two other eggs did not hatch - I think these were the ones I swapped for non-fertile ones: Betty continued to steal the other hens' egg as they laid them and each day, I had to take those freshly laid eggs away from her nest. I must have made a mistake earlier on - before we marked the fertile ones! On 30 May, at lunchtime, as I was about to lift Betty for her daily few minutes away from the nest, I was greeted with some chirping sounds coming from under her. A while later, when I went for another curious peep, two little heads were poking out through her feathers! She started taking them out of the coop for a few hours three days after they hatched and she has been successfully raising them since then. She has been teaching them to feed themselves, from showing them how to peck food when they were still in the coop when I had given them some chick crumb to nibble on to catching insects and other things as she takes them about the garden, free-ranging with her. She has had to protect them from one other hen who is particularly aggressive towards them and from Oscar, our cat, who has been keen to investigate these two balls of feathers wandering about the place! Betty is very protective and will chase him away before he has a chance to get too close! Phew! The chicks have also learnt from their mum what to do when she sounds the alarm: they immediately go and hide under bushes. A sparrowhawk visited the garden recently and she protected them that way. It was rather amazing to watch! They are also learning to preen themselves and stretch their wing feathers, which started to grow at about day 5! Yesterday, I saw that they were now scratching the ground like their mum! 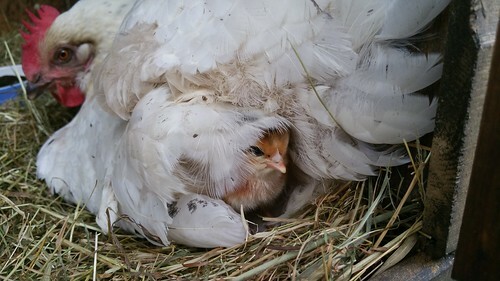 It was fascinating to watch the bonding process in action, the clucking noises Mother Hen made when they first hatched built their attachment to her so by the time they came out to discover the world, they were completely bonded to her, which they needed for their own survival. Betty is very attentive to them and this was demonstrated when she would climb the ramp into the coop a bit too high and they could not follow or see her. They would call her by chirping loudly to let her know that they had become separated and she would then come back down the ramp, sit with them for a bit then try again until they understood what to do. At times, it was very hard for me to resist the urge to "help". And of course, I would have done if there had been some trouble but each time I was tempted to intervene, I waited for a few more minutes to see what would happen next. Each time, my intervention was unnecessary and I was glad I was able to give myself extra time and stay with my desire to step in rather than act upon it. I am aware of my tendency to intervene too early and I also know that my reaction is rooted more in my need to relieve my own stress, worry and fear than to bring help to the animal. It is a useful thing to be aware of and I am grateful for my animals to be reminding me of this tendency of mine on a regular basis. Seeing the tiny chicks out with their mum in the garden was both incredibly joyful and overwhelming in equal measures. They seemed so vulnerable! I wanted to keep them cooped up in a box where I could see them! I have, however, learnt to trust Betty and her fantastic mothering instincts. I also know that it is much better for them to be outdoors as soon as possible, despite the dangers of being predated. It is there that they not only gain vital skills but also build their immunity so they grow more resilient health-wise. Such a dilemma for me in the first few days! 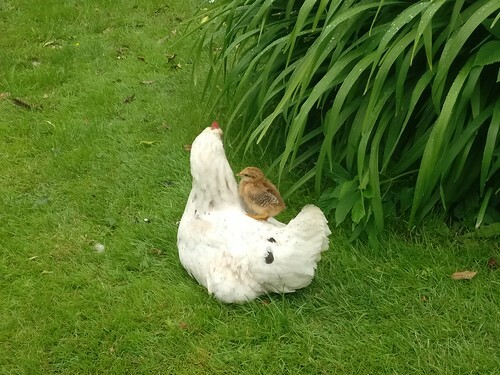 I resolved it by growing the part of me that knows it is best to leave Betty and her chicks to it and by learning to stay with the part of me that is feeling scared rather than act upon it and interfere to soothe myself. Whilst feeling the feeling, I was able to leave more room for the rational self to emerge and be in charge of me during that challenging time. 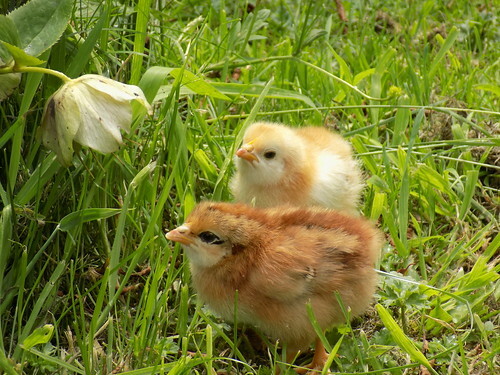 Of course, resolving my internal dilemma has also left much more space within me to enjoy the chicks. 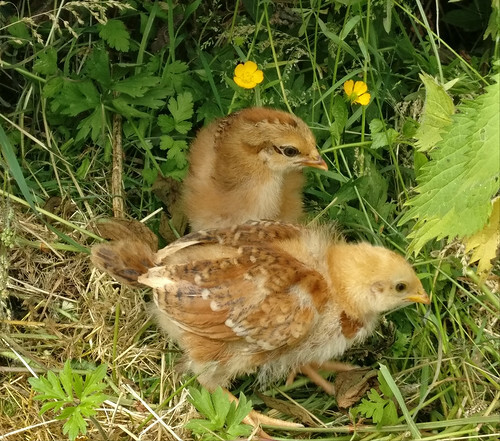 I watch the little feathery family unit go about their business, free-ranging in the garden all day, the chicks each day becoming less vulnerable, more able and learning new things. And I smile... as it is a pleasing sight - but also because they have enabled me to resolve an important dilemma within myself... they have helped me to grow.